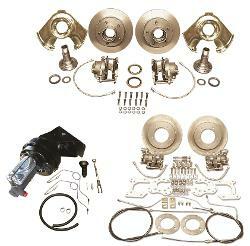 TBP Exclusive 4-wheel Power Disc Brake Conversion Kits offer everything you need to convert your 66-75 Bronco to Power Disc Brakes. Our full 4 wheel disc brake kit & power brake kit makes it easy for you to order a complete upgraded power disc brake conversion kit for your early Bronco. REQUIRES AFTERMARKET LOCKING HUBS (i.e. Warn, Mile Marker, etc). 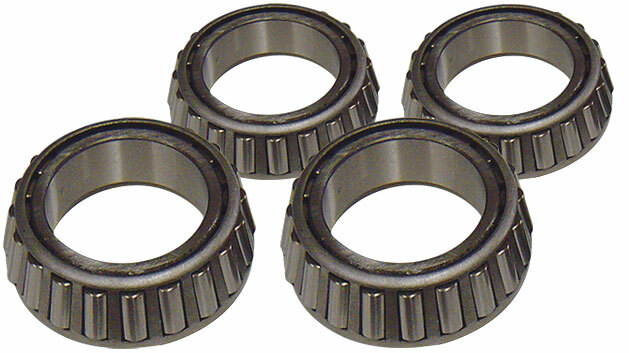 FOR EASE OF INSTALLATION, WE RECOMMEND PURCHASING NEW AXLE BEARING RETAINER PLATES. -- INSTALLING THIS POWER DISC BRAKE KIT WITH STOCK STEEL WHEELS OR SLOTTED MAGS WILL REQUIRE SPACERS FOR CLEARANCE. If you have factory 5 1/2" wide wheels, you will need a 1/2" spacer along with longer axle studs. If you have factory 6" wide wheels, you will need a 1/4" spacer. 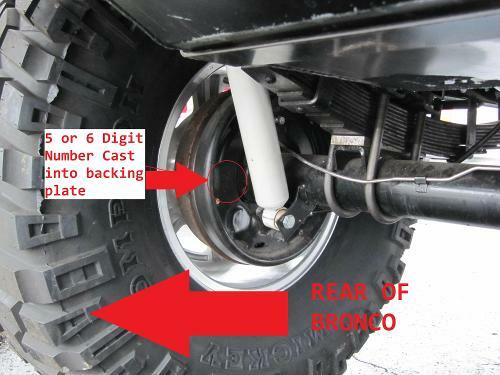 BACKING PLATE NUMBERS FOR REAR DISC BRAKE CONVERSION: It is essential for the customer to retrieve a backing plate number from the rear axle so that we can ensure you get the correct parts the first time. A photo has been supplied as to where to locate the backing plate number. These backing plate numbers are for 10" drum setups. If your number is not listed here, please look at our 11" setups to see if the number is listed there. The picture is referencing to the driver side. There is also a number located in the same position on the passenger side if driver side is unreadable. Fits 1966 to 1975 Ford Broncos with 10" rear drum brakes. I put this kit on my Bronco six years ago, and it has been stopping on a dime ever since. I am strictly a driveway mechanic, but with the clear instructions and perfectly fitting parts in this kit, I was able to do the job. Thanks, Tom ! !